NBA superstar and newly minted Los Angeles Laker LeBron James has given back to the community he has always called home, opening a school for at-risk students today in Ohio. "We just want everything for them. Everything and more. So it's going to mean a lot to me,” James told ESPN. The I Promise School, a new public school in Akron, established by the LeBron James Family Foundation and Akron Public Schools system, will run from July 30 through May 17, which is seven weeks longer than a normal school year. The school will also keep the students until 5 p.m. each day. "We want to create an environment of family and not like a workplace," James said. "Sometimes you can get tired if you look at it like work -- you kind of get tired of it. We want to create an environment of family where you want to always be around your family. No matter the goods and the bad, you always want to be around that support system. So that's what we're creating here." The school, which is designed for 240 third- and fourth-grade students, will offer hands-on, STEM-focused curriculum with James' "We Are Family" philosophy to students, according to a statement from the foundation. The school will be expanded to students from grades 1 through 8 by 2022. (Maddie Meyer/Getty Images, FILE) LeBron James reacts in the second half against the Boston Celtics during Game Seven of the 2018 NBA Eastern Conference Finals at TD Garden on May 27, 2018 in Boston, Massachusetts. "It was challenging," James said. "It was mentally challenging. Sometimes you think about a kid being in the third grade at that age, between 8 and 7 years old; in the fourth grade having responsibility or having stress -- no kid at 8, 9 should have stress. And I was one of those kids so I know exactly what those kids today are going through being a part of this. 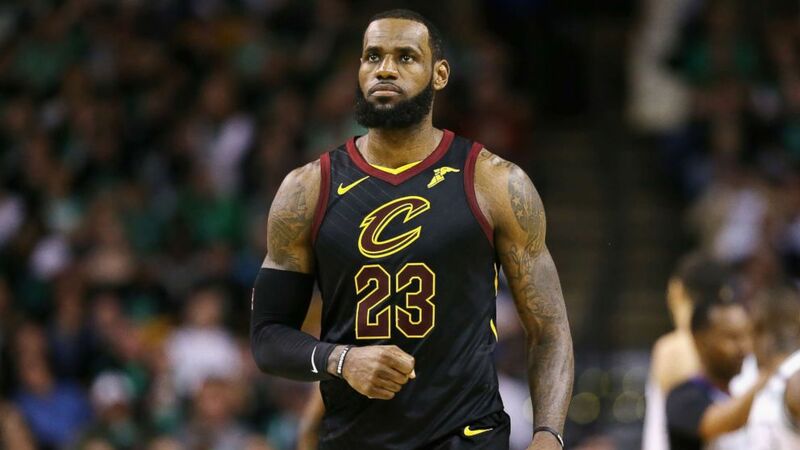 James, who played high school sports for St. Vincent-St. Mary in Akron and later for his hometown Cleveland Cavaliers, leading them to the 2016 championship, told ESPN's Rachel Nichols that this is about using sports to bring people together. "I live in sports. Without sports, we wouldn't all be here. I wouldn't be talking to you, Rach. You wouldn't be interviewing me. Sports is like, it stops race. Every race comes together to fight for one common goal and that's to win and to have fun and to have camaraderie and things like that. And for someone or a body of parties to try to divide us by using our platform of sport, sport has given me everything that I could ever ask for, I couldn't let that happen," James said. "I believe our president is kind of trying to divide us," James later said in an interview on CNN with Don Lemon. "He's dividing us, and what I noticed over the last few months [is] that he's kind of used sports to divide us, and that's something that I can't relate to." He went on, "I know that sport was the first time I was ever around someone white. I got an opportunity to see them and learn about them, and they got an opportunity to learn about me and we become very good friends, and I was like, 'Oh wow this is all because of sports.' And sports has never been something that divide people." "So, by using my voice and letting the youth know and the people that need the guidance know that I care for them and I'm going to be their voice, it's passionate for me because like I said, sports is just the ultimate to bring people together, so that's what I'm here for." The school will provide students who live more than two miles away from campus with daily bus transportation, according to the statement. Students will also receive free breakfast, lunch and snack daily, the statement read. Knowing that students cannot learn if they are struggling with issues such as hunger, trauma, or other logistical or emotional challenges, IPS will provide support to help eliminate those barriers and prepare the child physically and emotionally for learning, according to the statement.